An 85-year-old woman presents with progressive headaches and focal neurological deficits. â€¢ Infiltrating T2/FLAIR hyperintense left parietal mass that demonstrates heterogeneous enhancement, necrosis, and intralesional hemorrhage. â€¢ Dynamic susceptibility contrast-enhanced (DSC) perfusion MRI confirms elevated relative cerebral blood volume (rCBV) (2.47) compared with contralateral normal-appearing white matter (NAWM). â€¢ Signal intensity-time curve shows marked signal intensity decrease during peak arrival of contrast agent in tumor (green) compared with NAWM (red). â€¢ Hybrid (fusion) FLAIR and negative integral (NI) maps beautifully illustrate increased capillary density within areas of “red” (NI = rCBV). â€¢ Glioblastoma is the most common primary brain tumor and, unfortunately, the most aggressive, categorized as WHO grade IV. â€¢ High-grade gliomas (HGG) are characterized by vascular proliferation (neoangiogenesis) that serves as one of the most important histologic criteria for determining the degree of malignancy or tumor grade. â€¢ DSC perfusion MRI complements conventional imaging by providing quantitative estimates of rCBV that reflect the degree of inherent capillary density. â€¢ DSC perfusion MRI is based on changes in T2 relaxation time, accomplished using PRESTO scan (Principles of Echo-Shifting with a Train of Observations), an MR software application by Philips Healthcare*. â€¢ Conventional MRI: sensitivity, specificity, PPV, and NPV for determining HGG are 72.5%, 65%, 86.1%, and 44.1%, respectively. â€¢ Perfusion MRI: sensitivity, specificity, PPV, and NPV for determining HGG are 95%, 57.5%, 87%, and 79.3%, respectively (threshold value of 1.75 for rCBV). 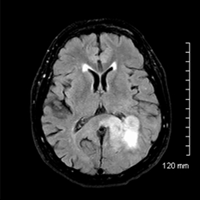 â€¢ Perfusion MRI (CBV maps + quantitative values) can be used to grade gliomas preoperatively, guide stereotactic biopsy, evaluate different tumor types, differentiate between recurrent tumor and delayed radiation necrosis, and monitor response to therapy. â€¢ Standard of care for HGG includes a combination of radiation with temozolomide (TMZ), and bevacizumab (Avastin, Genentech) for recurrent GBM.آ Perfusion MRI should become the imaging standard of care since it can help differentiate tumor recurrence from treatment-induced change (e.g,. pseudoprogression, pseudoresponse); the Macdonald criteria have become obsolete and should no longer be used. â€¢ Utilizing the PRESTO sequence, it is possible to image microscopic blood flow of hypervascular tumors (ie, flow at the capillary level). Our facility utilizes software that includes quantitative metrics and functional maps (NI, mean transit time, time to peak, etc) stored in automated ExamCards based on either a curve fit algorithm or a deconvolution of a predefined arterial input function. â€” Rahul V. Pawar, MD, is an attending radiologist with Saint Barnabas Healthcare in Livingston, New Jersey. â€” Kris Giordano, RT, is an MRI technologist with Saint Barnabas Healthcare. * Note: Rahul V. Pawar, MD, is a consultant with Philips Healthcare. Law M, Yang S, Wang H, et al. 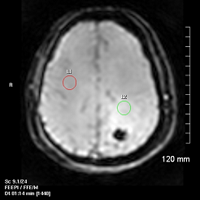 Glioma grading: sensitivity, specificity, and predictive values of perfusion MR imaging and proton MR spectroscopic imaging compared with conventional MR imaging. AJNR Am J Neuroradiol. 2003;24(10):1989-1998. Cha S, Knopp EA, Johnson G, Wetzel SG, Litt AW, Zagzag D. Intracranial mass lesions: dynamic contrast-enhanced susceptibility-weighted echo-planar perfusion MR imaging. Radiology. 2002;223(1):11-29. 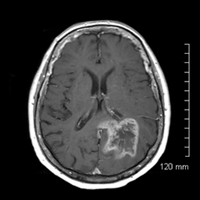 Fatterpekar GM, Galheigo D, Narayana A, Johnson G, Knopp E. Treatment-related change versus tumor recurrence in high-grade gliomas: a diagnostic conundrumâ€”use of dynamic susceptibility contrast-enhanced (DSC) perfusion MRI. AJR Am J Roentgenol. 2012;198(1):19-26. Submit cases directly to Rahul V. Pawar, MD, DABR (section editor for “On the Case”) at rvp325@yahoo.com. Cases submitted should be relevant and interesting. All modalities and subspecialties within radiology are equally considered. Copyright آ© 2012 Great Valley Publishing Company Inc., Publishers of Radiology Today. All rights reserved.